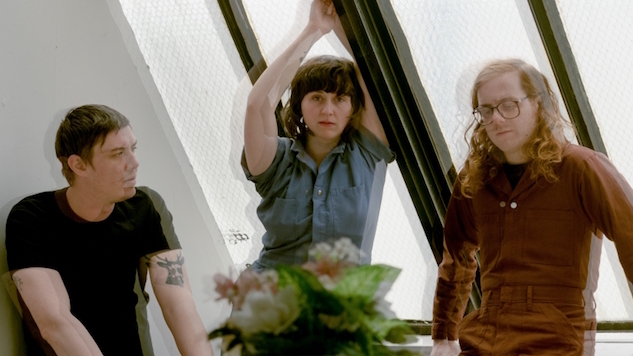 Daily Dose: Swearin', "Grow into a Ghost"
Great things often arrive in pairs. In the case of twins Allison and Katie Crutchfield, the greatness overflows in the form of music. Although the Alabama-born sisters have often worked together (namely in their now-dispersed punk band P.S. Eliot), each is currently venturing her own separate, Merge Records-backed hustle—for Katie, it’s her solo project Waxahatchee; for Allison, it’s Philadelphia punk band Swearin’. Waxahatchee shared a delicate new melody last week, and today Swearin’ have announced their first new album in five years, Fall into the Sun. The record’s first track, “Grow into a Ghost,” is a focused, punk lean-in, and you can give it a listen below. In 2015, Swearin’ split up, giving Allison time to release two solo LPs: Lean In To It and last year’s Tourist in This Town. Last fall, Swearin’ reunited as openers at a string of Superchunk shows, and in April they signed with indie label Merge. Beginning in August, they’ll be on tour. You can find those dates down below. Again, you can listen to “Grow into a Ghost” below. If you like what you hear, you can preorder Fall into the Sun from your neighborhood record store here, or digitally here.